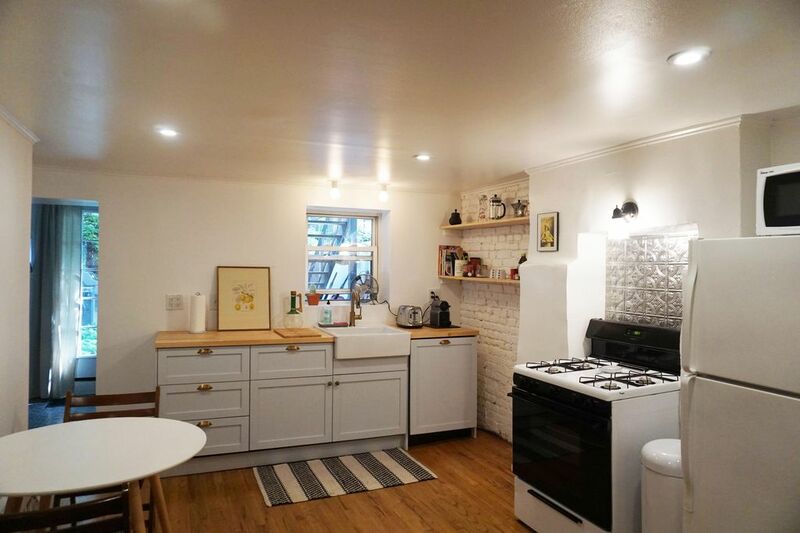 Located on a tree-lined street, this garden level, floor-through townhouse apartment is only one block from the Carroll Gardens subway stop (F & G) and has its own separate entrance and a lovely backyard. Close to parks, restaurants, cafes, stores and Sunday market. The sleeping accommodations include a queen size bed and a full-size sofa sleeper. Nespresso machine included, for coffee lovers like ourselves. WIFI and TV (with cable & Netflix). The location, on a quiet street just a few minutes walk from Carroll Subway, is perfect. We walked the neighbourhood, as well as to places in Dumbo, Fort Greene, Park Slope. The apartment is beautiful, clean, no clutter. The owner was a pleasure to deal with. This property was located close to family that lives in the area, so very convenient. Communication was very easy and prompt, a good amount of space. Towels were sour smelling and whole apartment needed a through cleaning, dust bunnies by bed and the bathroom floor and tile could use some attention. Nespresso maker had used pods in it and the water reservoir was dirty. Though we didn’t do any cooking, the kitchen appeared to be well stocked. My husband and I were very happy with this apartment. Very comfortable bed and living space. Kitchen and bath were clean. Location was perfect for exploring nearby shops and restaurants and super easy for the Metro. We’d definitely recommend it and will book it ourselves for our next trip! This is a lovely apartment on a beautiful, quiet block. It was perfect for my mother and her friend on their recent trip to NY. Tiz could not have been lovelier or more accommodating. The apartment was spotless and was stocked with towels, sheets and basic kitchen supplies. It’s a peaceful place to recharge after a day of sightseeing. My mother was perfectly happy on the couch and her friend said the bed was comfortable. They also loved the books. I live in the general neighborhood and originally wanted to book a place a bit closer to me but they said that when they come back they want to stay there again. I definitely chose well for them. Thank you Tiz! wonderful spot / perfect in every way ! Tiz and Chris have created a lovely spot in Brooklyn. It's clean and the pictures are very accurate. If anything, we felt the space was even better than the pictures! Tiz is super responsive and helpful. The apartment is exactly as it is described. A short walk ( 3 blocks ) lands you on Smith St. and Court St. where there are endless coffee shops, bakeries, and delicious restaurants. You won't be disappointed ! The trains to Manhattan are very convenient and easy to access. We also felt the price point for this unit was quite fair and reasonable.